COLUMBIA, S.C. (AP) — Tacko Fall was huge factor in bringing UCF its first-ever NCAA Tournament victory. Now, the Knights will see how college basketball’s tallest player at 7-foot-6 can perform against overall top seed Duke. Fall barely left his feet to haul in some rebounds as the Rams helplessly swiped at missed shots and struggled to find open space on drives to their baskets when the Knights’ towering center was nearby. VCU tried many things to keep him from getting involved, including sending two people to face guard Fall — or come as close as possible to a player who stands more than a half-foot taller than anyone on the Rams’ roster. “Some of those shots we get at the rim, it’s hard with him down there,” VCU forward Issac Vann said. The win, UCF’s first in five NCAA appearances, sets up several intriguing story lines with Duke. There’s the game’s tallest player against its most dynamic star in Blue Devils’ freshman Zion Williamson. And, of course, there’s the close relationship between UCF coach Johnny Dawkins and his former coach, now friend and mentor, Duke’s Mike Krzyzewski. “He is amazing. I know the young men (at Duke) I have heard so much about,” Dawkins said. Many could soon know about Dawkins’ players, too. UCF (24-8) built a 21-point lead in the second half. The Rams (25-8) narrowed the margin to 62-55 on De’Riante Jenkins’ 3-pointer with 4:53 to go, but could get no closer. Fall sealed things when he fought through two defenders and threw up a perfect bank shot while falling to the ground to put the Knights up 70-56 with less than three minutes to play. 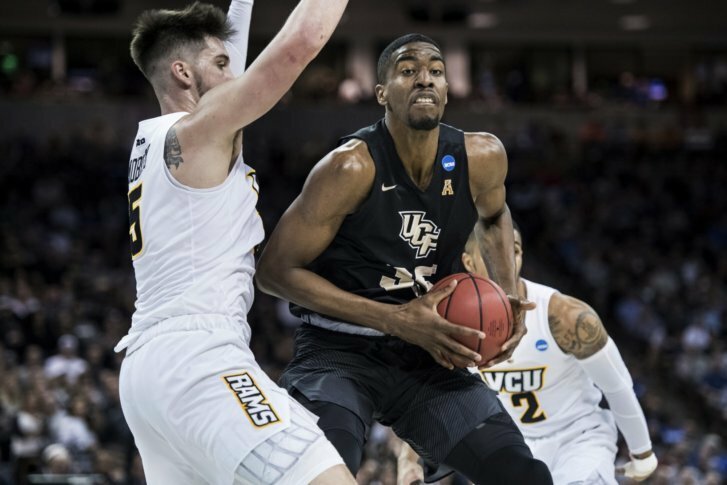 Fall sat for a moment on the court, fist clenched in celebration that for UCF had been a long time coming since its first NCAA appearance in 1994, its last in 2005. It was Fall’s 25th career double-double and seventh of the season. BJ Taylor led UCF with 15 points while Aubrey Dawkins had 14. Malik Crowfield had 11 points to lead VCU, a mid-major darling and Atlantic 10 Conference regular-season champions that ended the year with losses in the Atlantic 10 Tournament quarterfinals and now the NCAAs. The final game in Columbia featured Fall, the senior from Senegal who joined the Knights in 2016. VCU coach Mike Rhoades said he thought about having an assistant stand on a chair with broomsticks to simulate Fall’s massive, 8-4 armspan. It looked like he may have done something like it right before halftime as two VCU defenders surrounded Fall next to the basket, arms extended up near his face as the Knights attempted to inbound the ball with 2.8 seconds left. The ploy worked as UCF passed it out for a final shot that was off the mark. The Knights used a 10-0 run over the last three minutes of the half to go out front 34-24 as the Rams finished an awful shooting period by missing their final six shots. VCU was just 8 of 29 from the field and 0 for 9 on 3-pointers after coming in averaging better than seven baskets behind the arc. VCU’s comeback began when it found its outside stroke. After missing its first 13 3-pointers, the Rams went six of 11 from behind the arc. UCF: With Fall in the middle, the Knights could battle against most teams, but Duke presents problems. The Blue Devils may have too much freshman firepower to let anyone on the Knights slow them down. VCU: Too many slow stretches cost the Rams. They gave up the final 10 points of the first half to put themselves in too deep of a hole. UCF junior forward Aubrey Dawkins doesn’t expect much to change in his dad, Knights coach Johnny Dawkins, with the team preparing to face his father’s alma mater in Duke in two days. The younger Dawkins said his father has learned much from Krzyzewski as a former Duke player and assistant, including how to keep emotions and distractions from short-circuiting game plans. “We’ll do the same things we always do,” Aubrey Dawkins said. UCF goes against top-seeded Duke in the second round Sunday.